Everyone wants to know the ‘secret’ to growing their organisation. What is ‘the one thing’ that’s going to take them from where they are now to a more successful future. Today, buyers tend to engage only on their terms, in their own time and with branding they trust. What does your branding say about you? You must find a way to break through the noise and clutter. Good branding and positioning have become critical. Most businesses, not-for-profits and communities have some unique value, often hidden away. Good branding will help change your people’s perception of your situation and what you offer. Perception is everything, so make it worthwhile by putting quality time and resources into your branding. While new organisations need to define their brand image, they also need to focus on positioning themselves in the marketplace first. This means identifying what makes them different and translating their differences into customer benefits. The difference between a brand and branding? Brand – A brand is a symbol, design, term, name or another characteristic that identifies your organisation. Branding – Is a set of the other elements that reflects your uniqueness and vision for the organisation. Perhaps you feel there’s something missing, something that is holding back the success to which you are aspiring. Well, poor branding and positioning could be one of your roadblocks. Earning the trust of your chosen market is an important aspect of building a brand. Your customers are living in a new reality. They may not fully realise it yet, but their world has changed, they are actually living in a global marketplace where competitiveness is on the rise. Good branding will help bridge the gap to reality, which requires an understanding of the micro and macro trends in their reality. Branding and positioning are two important marketing terms. But while they are related to each other, they have very distinct meanings important for business leaders to understand. Even the smallest companies need to spend time considering how they would like to be perceived by their desired market segments. The first step, of course, is determining which markets to serve, who is already serving those markets and how these competitors may differ. Then organisations need to consider how they wish to be perceived by certain market segments, understand how they are currently perceived and take steps to close those gaps. According to Yankelovich Consumer Research, “We’ve gone from being exposed to about 500 ads a day back in the 1970s to as many as 5,000 a day today”. The result? An oversaturated market that is overwhelming the audience. This problem will only get worse, increasing the competitiveness of the marketing space and driving the need for marketers to break through and make a lasting and positive impression on consumers. Consumers have learned how to tune out and become immune to the noise and clutter. They turn on their spam filters, change the television channel and toss out junk mail. What worked before in terms of marketing is no longer effective. Organisations are seeing diminishing returns and reduced revenue, not to mention the increasing pressure to achieve better profitability. Don’t just try to ‘make more noise’ by investing more money and resources in the same ineffective marketing tactics. Running more ads, sending more emails, making more phone calls and do more on social media, only turns more people off. Before developing your brand, carefully look at your market positioning. Positioning involves identifying your target market segments you seek to serve and claiming a position or reputation in those segments. These can be local, regional, national or even international. Within segments, you might further identify attributes such as age, gender, income, or areas of interest. The more clearly your segments can be identified, the more specific you can be in branding programs to reach out and influence those in each segment. Positioning can be about where you rank in your customer’s thoughts in relation to your competition. Positioning is also about differentiating yourself from your competition. In other words, how will you be different from all the other businesses that provide the same products or services? Learn as much about those competitors as possible. Their product offerings, pricing, distribution channels and promotional efforts and determine how you might claim a different position based on your own attributes. Once the desired position has been established, companies will work to establish and strengthen a brand identity designed to claim that position within the marketplace. Positioning always comes before branding. Positioning is about attracting your market to your organisation. The experience the market has with your organisation will determine if you’re successful in positioning your organisation and building a positive brand image. A brand is sometimes described as the identity or the personality of a product, service or organisation, determined by the target market. People will often identify how they wish to be perceived and then take steps to influence customer perceptions based on product, price, distribution and promotional elements of their marketing mix. Branding helps to claim a brand position. You claim a brand position based on your activities and actions. Just like individual’s personalities are determined based on how they are viewed over time by others, the same is true of organisations and products. Claiming a brand position requires ongoing efforts to convey a consistent image and message to target market segments. All activities, from the attributes of the product itself to the organisation’s service to employees and promotional activities. It is consistency over time, reflected through the actual performance that will help a company effectively claim a brand position. With enough persistence, struggle and learning, the positioning and branding eventually begin to take care of themselves and the true identity starts to emerge. Does your branding convey your true values? If you expose your true values and deliver good customer experiences on the benefits you offer, you will be successful in building a positive brand image. Far too many businesses put way too much emphasis on their logo and not enough on the values and customer aspirations it represents. Your logo should look great. It should be something that you are proud of. What matters is the product, the customer experience and the overall package that stands behind the logo. If your true values are where your priorities lie, your branding, even if it’s not flashy, will still be recognised and mean something to your customer base and various market segments. It’s that simple. No magic tricks, no gimmicks, just the truth. Your branding isn’t simply a paint job to disguise a lacklustre operation. Customers are smart and will eventually establish the truth. I’m sure you will have spotted bad businesses with the pretty look and logo, but terrible products and execution. Only one thing truly matters, the value and service being provided to your customers. If you excel at that, your branding and positioning, even if it is incredibly plain, will be seen as a great place to do business. 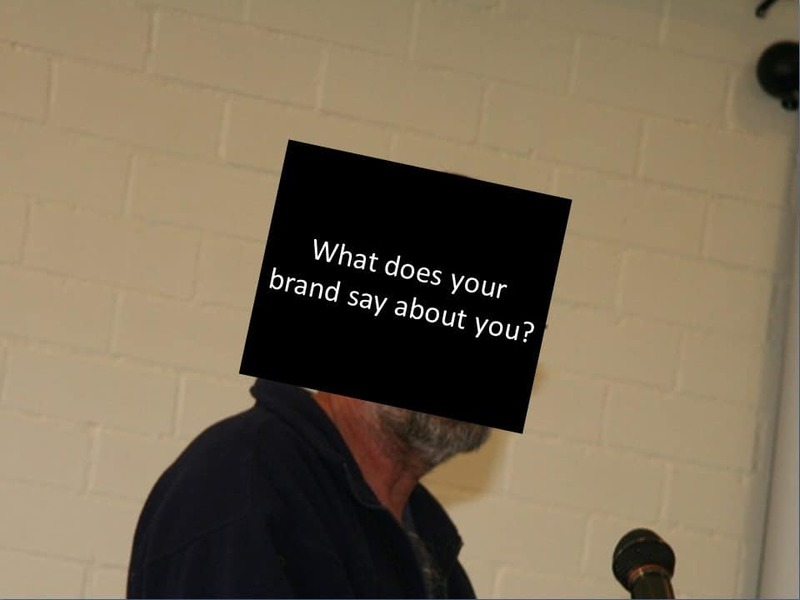 Ask yourself if your brand was a person, how would it talk to them and what would it say? If you want to upgrade your branding then do not rush the task, it’s too important. The key elements to creating a sharp and authentic brand that resonates with your customers and differentiates you from your competitors take time. It usually takes many weeks, months and even years of elapsed time to develop a brand that really works well. Your brand is what you are really selling to your customers, not just a product or service for which there may be existing providers. A strong brand can make any business stand out from the crowd. Who would have ever thought a shell would be a good logo for a multi-national oil company. What do you think of when you see today’s Shell logo? Every business wants to be a customer’s first choice. However, without creativity and innovation, this is unlikely to happen. Building and managing a brand can play a significant part in communicating your capacity to innovate. There are many thousands of businesses with very good innovative ideas, but they keep them well hidden. Your branding should demonstrate your originality and capacity to innovate when it comes to customer problems, frustrations, wants and needs. The concept of a brand extends far beyond just your company logo. It covers your business’ core values and every interaction you have with customers, suppliers and other stakeholders. In effect, your brand can create and maintain your reputation as an innovative organisation and reflect your customer’s experience of your organisation. Where do you get the time to improve your branding? Outsourcing brings in outside objectivity that can evaluate without any bias and brings in a fresh perspective, which you can use to improve your branding and positioning. As there are many components that go to make up your branding and positioning package, it may pay to outsource some that you are not able to do well. It isn’t always necessary to have your company name as part of the logo. Remember the adage, less is more. It is easy to try and put everything your company represents into your logo. Simple, clean logos are those that are lasting and impactful. Successful branding is about promoting your strengths. Start by thinking about what you’re good at and what you believe in. Creativity and innovation in your chosen market so you can maximise your efforts. Particular skills for solving customers problems and frustrations because you want to create customer loyalty. Reliability in delivering on customer wants and needs because you always want to deliver on promises. Often referred to as ‘brand values’. High-quality customer service generating exceptional customer experiences because that is what keeps customers coming back. Providing the best value for money in your marketplace so you brand really means something. Your business name because you want it to mean something. The names of your products or services so customers will relate to them. The company website because that is where people will be looking for you. Your company social media so it is congruent with you values and your desired customers. The quality and suitability of the business infrastructure because you don’t want it to let you down. Slogans you might use so your messages are clear and meaningful. Your logo because you want it to be unique and stand for something. The style and quality of your stationery so it projects the correct image. The style and quality of your marketing collateral so prospective customers are not turned off. Product packaging because it is an important part of the customer experience. How you and your employees behave so that customers enjoy doing business with you. Where and how you promote because you don’t want to waste your resources. How you and your employees dress for success. Emails so they are opened and don’t turn recipients off. Product pricing because if it’s right you make more profit. Your motor vehicles because they are projecting your brand value. If these are consistently in line with your brand values, your brand will be strengthened. But, if they aren’t, your brand and your business could be seriously damaged. A brand makes promises to customers and if they aren’t fulfilled, your customers will be far less likely to buy again. Adaptability. Make sure your logo works in various colours and sizes and can be utilised across all media. Ensure your design will work on a wide range of marketing materials e.g. a computer screen, clothing, glossy magazines, posters, merchandise, billboards and even bumper stickers. It is also important to look at how the logo you choose will fit with future products and services you might offer. Recognition. Create a logo that is easily recognisable. A logo that helps differentiate your company from your competitors and easily recognisable by your customers. It must speak to the essence of what your business is all about. Think about the vision for your business and the ways to communicate the values of your business in a logo. This is a tall order, but worth aspiring to. Don’t stress. The logo is just one piece of how you will communicate the value of your brand to your customers. Don’t obsess with trying to create the perfect logo first time. It isn’t possible, you can change it over time. Get help. Even with all the great computer graphics software at your fingertips, it will pay to engage someone with a graphic design background to assist you. If possible, include customers and employees in the review process. Invest the necessary time and money to produce the best logo you can. It will pay off in the long run.